Sifu Frank's martial arts training began officially in October 1990 but his fascination started many years prior. Growing up in City Heights in San Diego, there was an old movie theatre where the current Nhu Y Restaurant stands now that played many Shaw Brother Kung Fu movies on the weekends. Because his family did not have a lot of extra money, Sifu was not able to begin any formal lessons. This changed when he found out his high school counselor, Mr. George Berriochoa, was a Tang Soo Do Black Belt instructor at Kenyon's Tang Soo Do. Sifu Frank was very fond of "Mr. B." and credits Mr. B. for shaping how Sifu Frank teaches and treats his students to this day. Sifu Frank achieved success on and off the mat under Mr. B's tutelage but his desire to pursue a Chinese martial art was too great. After high school in 1994, Sifu cross trained with and against other styles and finally settled on learning Choy Li Fut and Yang Tai Chi at White Dragon in 1997. There, he had a great education on Chinese martial arts and how to run a business. He met many great friends that he still keeps in touch with now. After 4 strong years, a lot of medals, and achieving the fastest black sash (at that time), Sifu's time at White Dragon ended in September 2001 after he came to the conclusion that White Dragon was not what he was looking for. Because of Sifu's difference of opinion with management, he, too, was not what White Dragon was looking for which lead to the parting of the ways. Sifu does not regret leaving White Dragon but does regret how things ended. After exiting White Dragon, Sifu gave up martial arts for a year until he got the itch to train again. He cross trained with other styles again while trying to keep up on the Choy Li Fut and Yang Tai Chi he had learned. In his return to martial arts, Sifu realized quickly that he was not a very good fighter nor was he prepared to fight other styles. He knew he loved Choy Li Fut and Yang Tai Chi but he just needed to understand those systems better on a deeper level beyond just doing forms. 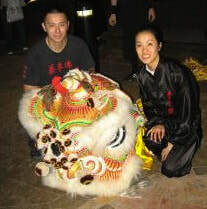 In 2004, Sifu joined the Chan Family Choy Lee Fut lineage and trained there until 2009. Sifu Frank and his wife spent 5 hard years in this organization. The training was very difficult and old school yet extremely beneficial and detailed. Their understanding of the Choy Lee Fut and Shaolin legacy was heightened. In 2009, after discussing with Grandmaster Chen Yong Fa, it was mutually agreed up on that Sifu Frank leave Chan Family and be on his own. That was the beginning of how Three Treasures was founded. Starting our own Kung Fu school was the best thing to happen to Sifu Frank and his family. He could now do things his way. The best lesson Sifu Frank learned was to not be in big organizations and to stay true to himself. Three Treasures will also be thankful to the Chan Family Choy Lee Fut organization for their outstanding knowledge of the system and for accepting us. Even though we are not in their organization, we recognize Grandmaster Chen Yong Fa as the Keeper of the Choy Lee Fut system. Frank Du with his Kung Fu teacher, Grandmaster Raymond Wong, in Rosemead, CA. After exiting the Chan Family Choy Lee Fut lineage, Sifu Frank taught Kung Fu and Tai Chi independently and stayed away from joining other associations or looking for a new teacher. But in 2012, Sifu learned of Grandmaster Raymond Wong while competing at the Tempt One Kung Fu tournament in Los Angeles. Three Treasures grabbed the attention of GM Wong when we swept many categories and dominated the tournament in all areas. But it was not until 2015 when Sifu Frank was formally introduced to GM Wong. Sifu Frank was in the final round to win Grand Champion of the tournament and ended up finishing 2nd. GM Wong was the head judge. Sifu Frank was formally introduced to GM Wong by Hung Gar master Kurtis Fujita and the rest is history! Sifu Frank finally found a teacher that is everything he has been looking for all his life and has never been happier. Sifu Frank makes the weekly trek up to San Gabriel Valley to diligently train with his teacher so he may be a good representative in San Diego. Click here to learn more about Grandmaster Wong. Sifu Frank with Master Bill Helm (above left) at his home. Master Helm is an accomplished martial artist as well as a professor at Pacific College of Oriental Medicine. He was the top student of Grandmaster Abraham Liu of the Yang Style before becoming a direct disciple of the lineage holder of the Chen Style system, Grandmaster Chen Xiao Wang. The opportunity to train with the blood descendants of Yang Cheng Fu was too great to not take advantage of. By the time this opportunity came up, Sifu Frank was already in love with the Chen Style and was not going to do another Tai Chi style unless the opportunity was special. Being accepted into the Yang Family Tai Chi Association and learning from the current keeper of the system, Yang Jun (above left), has been a great honor. Despite having to relearn most of the Yang Tai Chi, Sifu Frank has trained diligently to be the only representative in San Diego. Three Treasures is proud to be students of Stronghold BJJ under the guidance of Professor Michael Cusi (above left). Good friend Robert Wong (above right) called us to Lion Dance at the Grand Opening of his North Park BJJ school and we struck up a great friendship ever since. Stronghold BJJ is not only one of the top schools in San Diego with a direct lineage to Cobrinha Los Angeles, but they are also humble and family oriented. Three Treasures has cross trained with other BJJ schools but it was Stronghold that we felt most comfortable training with. We are proud to have some of the most authentic lineages in Chinese martial arts in San Diego. Nobody can dispute that the source of our knowledge is come from the top instructors of their particular style. Uniquely, Sifu Frank has trained in the 3 remaining styles in the world that still has blood descendants. Collectively, our staff has benefited from Sifu Frank's fusion of knowledge and they will easily pass up Sifu Frank in skill which is exactly what he wants. What do these authentic lineages mean to you? Absolutely nothing. At the end of the day, the student is the one who puts in the work and dedication. We should never ride the coat tails of others no matter how good past masters were. Even though martial arts has blanketed most of Sifu Frank's life since 1990, he is quite accomplished in other areas. He was an accomplished baseball and tennis player in middle school then transitioned to badminton and basketball in high school. After high school, he was a walk-on badminton coach at his alma mater Mission Bay High School for 13 years. He then coached at Serra High and retired in 2010 to focus 100% of his attention on building Three Treasures. In 2017, Sifu Frank came out of retirement to be the assistant badminton coach at Scripps Ranch. In all, Sifu has coached over 50 champions and won CIF in 2003 while finishing 2nd in 2007 and 2009. From 2001 after leaving White Dragon, Sifu Frank embarked on a new identity as a financial services representative and then Financial Advisor until stopping in 2009 to start Three Treasures. During this time span, Sifu also worked part time at the YMCA of San Diego in various positions. First as a Personal Trainer teaching Tai Chi and later promoted to Community Relations Coordinator and worked in the sports department. His time at the YMCA and as a Financial Advisor laid the foundation for business model for Three Treasures. On his free time, Sifu Frank loves spending time with his two kids and wife. He is also an avid music collector, citing YouTube as one of the best inventions ever. He enjoys rediscovering songs from his youth and exploring hits from different decades. He loves Chinese music and karaokes as much as he can but only in private as he cannot sing worth a lick. When not teaching Kung Fu or training or being with his family, Sifu plays competitive basketball and loves to read about history, Chinese medicine, and improving his Chinese. Sifu is 100% in love with his life choices and grateful to his personal family and Kung Fu students. Sifu's desire to do things with the best interest of others in mind has paid of in so many ways. He has created many meaningful jobs; helped a lot of children; and maintained the quality and purity of the martial arts. Sifu stands tall everyday knowing he has avoided taking the easy road and stood by his morals.